Cast Iron Radiators from our popular traditional range of Sovereign Radiators are available in 4 heights - this one at 360mm high or 14inches is the smallest version. Sovereign Cast Iron Radiators are available in several complimentary heights, there is also a 6 Column version of these Sovereign Cast Iron Radiators. 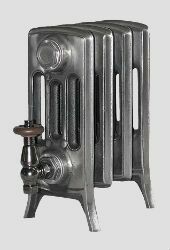 Cast Iron Radiators Made using a traditional casting process in Europe. 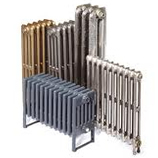 Cast Iron Radiators from our Sovereign range are quite simply the best quality available in the UK. These sections are cast in Europe and assembled at our North Yorkshire factory exclusively by Period Style LTD. 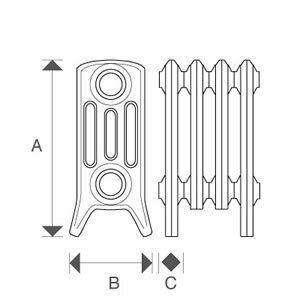 Such castings are subject to rigorous engineering tolerances that are used in manufacturing castings for engines, which is why each and every cast iron radiator has sharper detail and why we can give a 25 year guarantee. All traditional radiators are delivered to you fully assembled and tested in accordance with the British standard. They also have a 25 year guarantee to ensure peace of mind for years to come. As standard column radiators are finished in a primer, with the option to have them painted in any standard RAL colour or fully polished these can be finished to suit any property, be it a period or contemporary building.